Mars has been the target of many robotic exploration missions over the decades. The robotic invasion of Mars continues. Two spacecraft are scheduled to arrive in orbit around the Red Planet over the next week: NASA's Mars Atmosphere and Volatile Evolution probe (MAVEN) will get there Sunday night (Sept. 21), and India's Mars Orbiter Mission should follow suit on Wednesday (Sept. 24). The solar system is full of interesting and exotic worlds. Saturn's moon Enceladus and the Jovian satellite Europa, for instance, both harbor potentially habitable oceans of liquid water beneath their icy shells. So why does Mars continue to get so much attention? Maven will orbit Mars, looking for clues about what happened to the planet's once-thick atmosphere. The fascination with Mars goes back at least a century, to observations made by astronomer Percival Lowell, said Richard Zurek, chief scientist for the Mars Program Office at NASA's Jet Propulsion Laboratory in Pasadena, California. Lowell spent a great deal of time studying Mars in the late 19th and early 20th centuries, and he became convinced that he saw "canals" on the planet's surface — vast systems of earthworks that he believed an intelligent civilization had built. Lowell popularized this hypothesis in several books, including "Mars and Its Canals" (1906) and "Mars as the Abode of Life" (1908). "That idea of life elsewhere in the solar system is, I think, a huge claim on our attention," Zurek told Space.com. Lowell's canals were an illusion, of course, but he wasn't off base in supposing that Mars could be capable of supporting life. 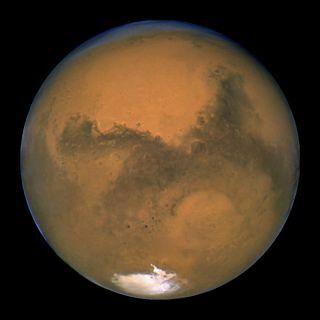 "From what we know about life, Mars is one of the best places in the solar system where life could have originated, and where it might even be today, although we haven't found any evidence for it at the surface," Zurek said. Indeed, observations by Opportunity, Curiosity and other Mars craft have shown that the planet was much warmer and wetter billions of years ago, with lakes, rivers and, perhaps, oceans spread across the surface. Mars is also interesting because it looks so different today than it did in its wetter past, Zurek said. MAVEN's chief task, for example, is to help researchers determine how and why Mars' climate has changed so dramatically over time. The probe will study the planet's upper atmosphere, seeking clues about where the water present on ancient Mars went — whether the substance retreated into the crust or was lost to space. The many robotic Mars explorers are also scouts of sorts, because the planet is a destination for manned missions — the top long-term priority, in fact, for the international human spaceflight community. NASA is currently working to get astronauts to the vicinity of the Red Planet by the mid-2030s, as directed by President Barack Obama in 2010. "Of all the planets, Mars is the place where you can actually visualize an astronaut standing on the surface, doing something," Zurek said. "You're not going to do that on Venus, where it's hot enough to melt your boots." Other worlds in the solar system are generally too hot (Venus and Mercury) or too cold and distant (the moons of Saturn and Jupiter) to be viable human destinations in the near future, he added. "If we're going to go to a planet away from the Earth anytime soon, it's going to be Mars," Zurek said. Mars' relative proximity to Earth is also a big inducement for robotic exploration, of course. MAVEN will arrive at the planet after just a 10-month trip, for example, while Europe's JUICE mission (short for Jupiter Icy Moons Explorer) won't reach the Jupiter system until 2030, after a planned 2022 launch. And the success of robotic missions over the years has also built up a Martian momentum, as new discoveries stimulate new questions and spur further exploration, Zurek added. All of these Martian attributes and characteristics — its location, its potential to host life, the mystery of the planet's changing climate and its status as a human destination — have combined to make Mars a compelling exploration target over the decades, Zurek said. "Those themes still resonate today, even with all that we've learned about the planet," he said.